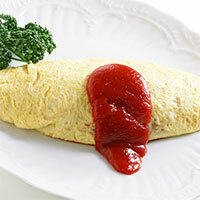 Omelet rice, also known as Omurice, is a Japanese meal also popular in other Asian countries. The meal consists of rice and a thin omelet pancake. The omelet is made by whisking eggs, milk and olive oil together, then fried in the shape of a thin pancake. Rice is first boiled, then fried with ketchup, chicken, onions, and optionally mushrooms or mixed vegetables. It is usually seasoned with salt, pepper, and green peppers, after which rice is rolled into an omelet, making a shapely and savory meal. Omelet rice is a very good choice for someone maintaining a diet, as it is a highly nutritious and balanced meal. The calories in Omelet Rice per 362.5g(1 serving) is 587 calories. Omelet Rice is calculated to be 162Cal per 100 grams making 80Cal equivalent to 49.38g with 85.3g of mostly carbohydrates、20.3g of protein、16.13g of fat in 362.5g while being rich in vitamins and minerals such as Molybdenum and Selenium.